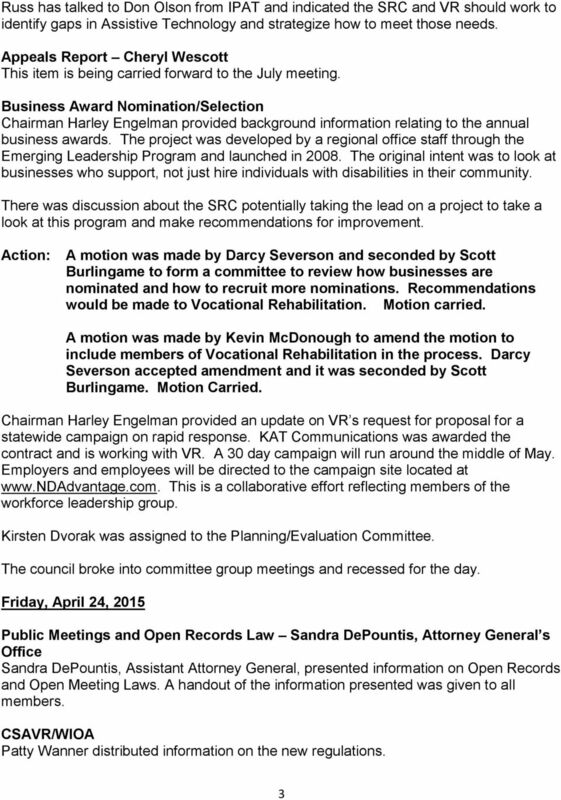 Download "NORTH DAKOTA STATE REHABILITATION COUNCIL QUARTERLY MEETING PRAIRIE HILLS PLAZA April 23-24, 2015 MEETING MINUTES"
This Attachment represents a triennial assessment updated for the threeyear period beginning FFY 2014. Job-Driven Vocational Rehabilitation Technical Assistance Center (JD-VRTAC) How Does the Dual Customer Approach Support VR Employment Outcomes? 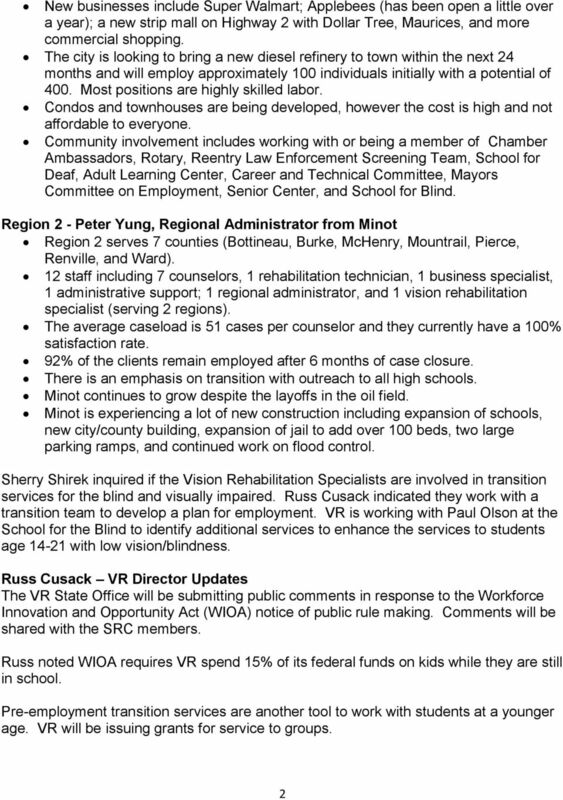 Vocational Rehabilitation and Blind Services Pre-Employment and Transition Services (PETS) Workforce Innovation and Opportunity Act of 2014 (WIOA) Today: Vocational Rehabilitation and Blind Services basics. Minutes. Maricopa County Special Health Care District Board of Directors Meeting Maricopa Medical Center Auditoriums 1 and 2 June 10, 2015 1:00 p.m. 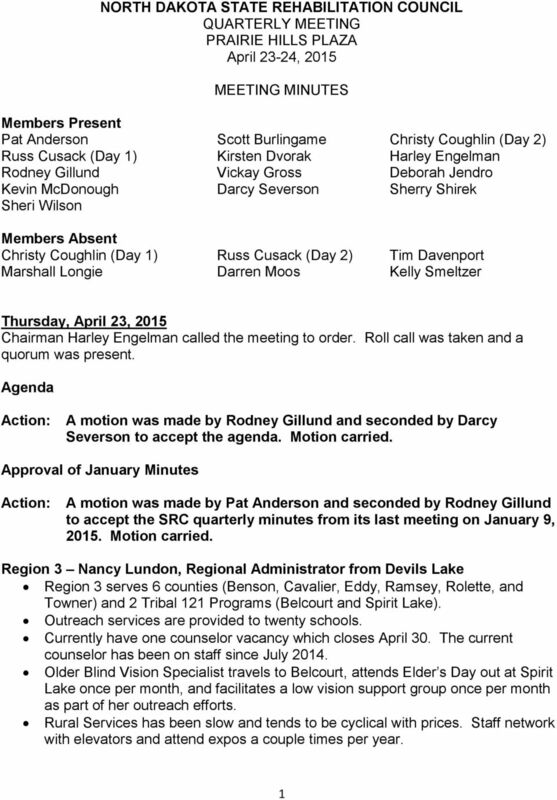 Agenda Board of Wahkiakum County Commissioners Regular Meeting November 19, :30 a.m.
Wisconsin DVR continues to address the needs identified in the previous plan and have maintained them as priorities for FFY 15. 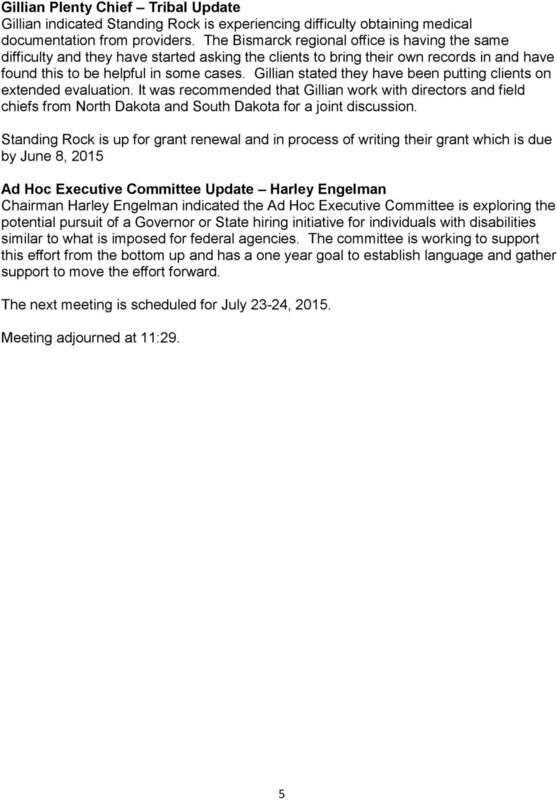 Rhode Island State Planning Council Approved Minutes of Thursday, June 11, 2015 Meeting William E. Powers Building Conference Room A One Capitol Hill, Providence, RI I. ATTENDANCE 1. Members Present Mr. The Hunt for New Cases: Is That the Answer? These goals, related strategies and data indicators are addressed in detail in Attachment 4.11(c)(1). CITY COUNCIL Regular Meeting. January 19, 2015 7:30 P.M. ROLL CALL: Aldermen present were: Neil Clark, Stunkel, B. John Clark, Swarm and Hobler.